We have had over 100 people at todays event. Thank you for showing up. Logs will populate shortly. This year has been great fun. Are you ready for FallFest? We are hopeful to see you at this years event. We still have three time slots and a moderator position for volunteers. Please contact a staff member on discord for info. This will be a great event this year. Please join us at 9 AM Pacific on the 15th! 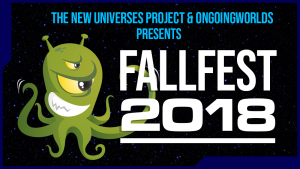 This is the site for FallFest VIII or the Simming Fall Festival 2018. This site will be for information about the conference. We will be posting more on this site as the event comes closer and goes on. We hope you enjoy this years event! Josh on behalf of the TNU Project Fall Festival Organizing Committee.